Lotus Blossom Tank KAL: Hi Everyone! Here's my yarn and swatch for my very first official knitalong. Not sure if I should be excited or nervous, but what the heck. I bought all 5 cobalt skeins left when Article Pract (Oakland, CA) cleared their lot of SWTC Bamboo 2-3 months ago. It's a good thing too since I know I'll have to lengthen at least the top half of the tank for sure. Will be knitting the 39" size. Got gauge using #7 needles (Boyes interchangeable). What color is your yarn? I love the color! It's #521, cobalt blue. Oops, forgot to put that in my post, didn't I? At least the blue part. 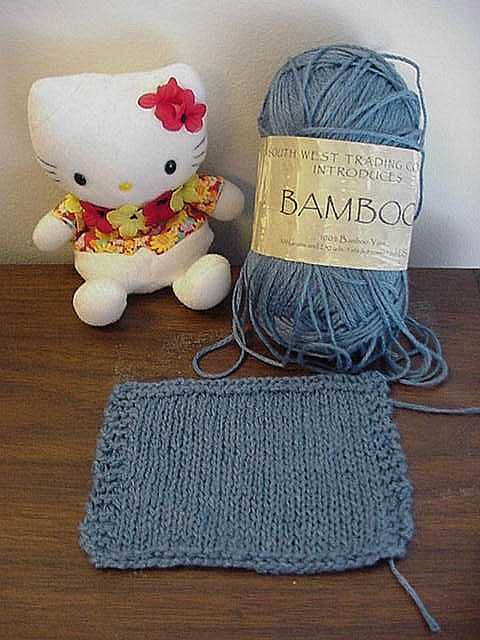 Does knitting the bamboo to that gauge make a hole-y fabric? I've been having trouble getting gauge, 5.5 sts turns out really loose and see-through for me. It's kinda mesh-like when I first knitted it up, less so after I washed it since it did bloom a little. It's probably fine for the lace part but I may need a camisole underneath for the upper part. Maybe I'll knit up a swatch on size 5 needles to see what kind of drape & look I'll get, but I'm pretty sure I won't get gauge. I am 6.5 sts per inch on my Size 5 needles. And it seems loose to me. Very sproingy. I am thinking about moving up to 7s but it will probably be very holey, which I will not like. I am going to wash/block and see where I am at. wow, it's interesting what variety we're getting on needles and gauge. I get 5.5 spi on size 5 grey inox. The combination of yarn and needles is making me knit just a tad looser than I usually do. But I'm happy with the drape at that gauge. It is a bit meshier than usual, but to my eye perfect as a summer top. Do we love Article Pract or what?? ?